You must have noticed that recently lehenga kurti design and pattern has become very popular for women. Yes, you can team up a lehenga with kurti instead of the regular blouse. 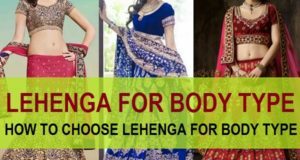 Lehenga and kurti looks beautiful even on the women who have got curvy body or with belly fat. It hides the flaws and also gives you an Illusion of taller stature. We have compiled the images of the beautiful and latest kurta with lehenga designs for women. This can be worn for small get togethers, parties, functions and other wedding ceremonies. So, in total you can wear this for any of the ethnic festival or functions that we have in India. This is a beautiful dress that is made for Cocktail parties, wedding ceremonies and for your sister’s wedding event. With Silk kurta there is this brocade top which looks beautiful. The uneven hemline adds more beauty to this attire. It is embellished and embroidered. The kurti is of silk in maroon color that goes perfectly with the dress. It would look beautiful on women of all skin tones. You can try a kurti and lehenga dress like this with full sleeves or even with sleeves of net fabric. 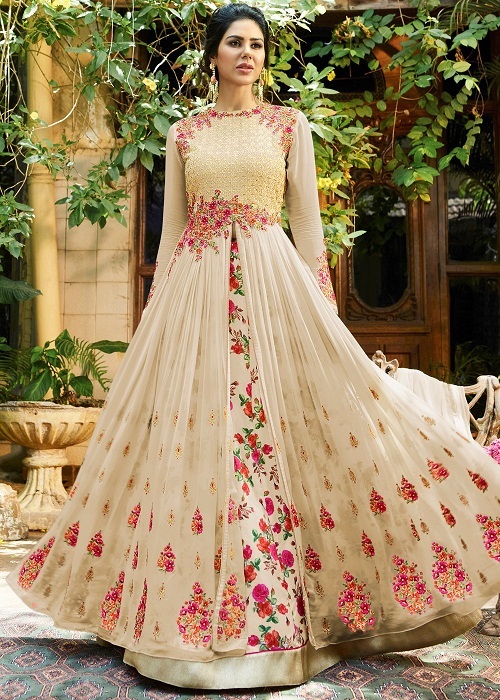 This lehenga kurti design is beautiful and has that feminine delicate feel to it. The net sheer kurta has lining underneath. The embroidered top kurta part is embellished with stones and sequence. The lehenga is of net material with a lining. It looks pretty and even bulkier women can wear it. This color looks good on women with all the skin colors and this can be teamed up with high heels so that you look taller. The kurta has blue embroidery on the bottom part and gold on the bust part. It has short sleeves with taffeta silk skirt. This lehenga kurta designer is beautiful for girls and women of all age groups. You can take a dupatta along with this or even without. The sheer fabric for the skirt part is used which has got embroidery all over it. 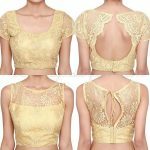 The bottom lehenga part has printed fabric with border at the bottom. The best part is gold fabric with pink and gold embroidery. This is a beautiful piece for the wedding and Indian functions. The front slit of the kurta goes till the waist which gives it very modern and glamorous feel. This is a lehenga kurta design for parties. The gold peach colored skirt has black border and the kurta is slightly longer in length and has got a white pretty gold border at the bottom. The black colored kurta is adorned with beautiful embroidery, it comes with a full sleeves. Or you can also keep the sleeves till the elbows or make them short sleeves. The brasso net gold colored fabric is used for the kurta. It has full sleeves and a centre slit that goes till the bust part. 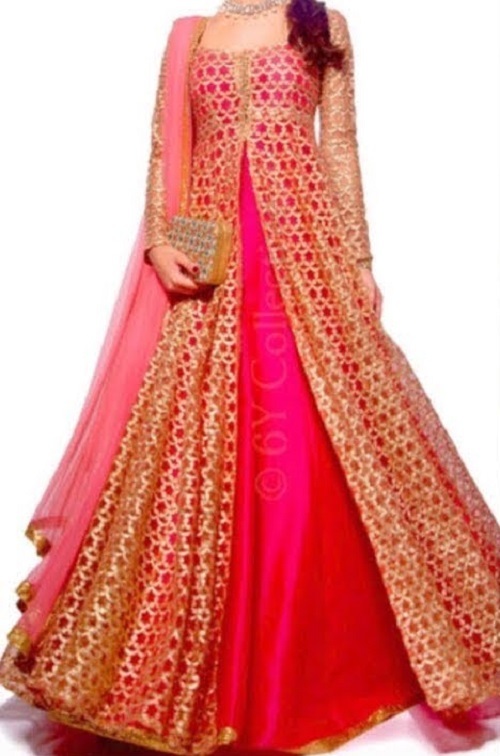 The pretty pink color is used for lehenga. It is a must have party wear clothing. You can try this type of design in different colors and designs but the pattern of the dress is so pretty that you should try this. This design can be teamed up with high heels and a box clutch. The gold kurta is made with sheer fabric that has detailing of embroidery and sequence all over it. The kurta comes with full sleeves and appliance in neckline. The velvet black skirt has embroidery which makes it even more glamorous and pretty. This is a dress that can be worn for a friend’s wedding and even for your own reception. 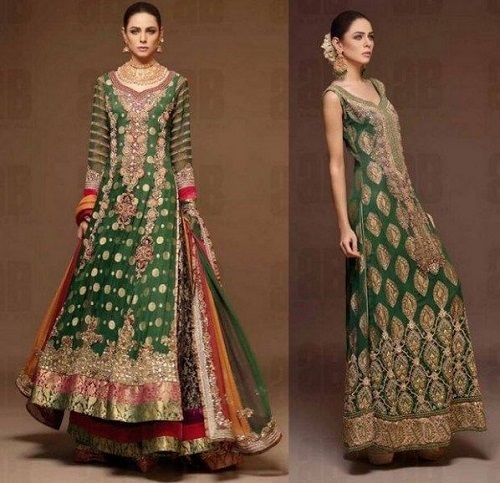 The green full sleeves lehenga kurta comes with a heavily embroidered kurta with sweetheart neckline. The brocade lehenga gives it more volume and flair. On the other side, the green kurta is paired with a skirt but is sleeveless. This is sleeveless with curved hemline and a mandarin collar. It is paired with an art silk lehenga. 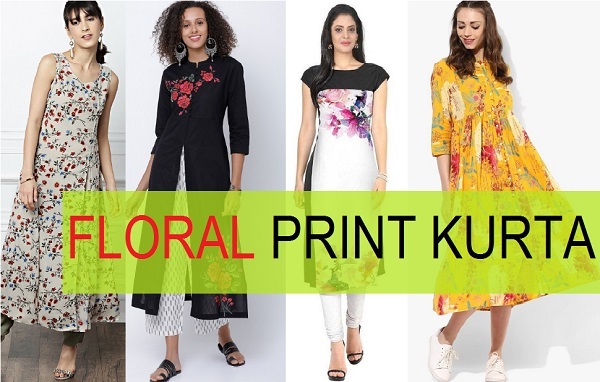 It is a very modern looking kurti design that is suitable for girls. It can be worn with flats or heels and a small Clutch bag would look perfect with this design. The colors are bright like orange and pink which gives it very beautiful look. If you like light pastel colors, then this design and the color combination will suit you. The diagonal hemline kurta has broad border on the lehenga and embroidery patch on one of the shoulders. This is such a beautiful kurta and very unique that you would definitely make the head turn. 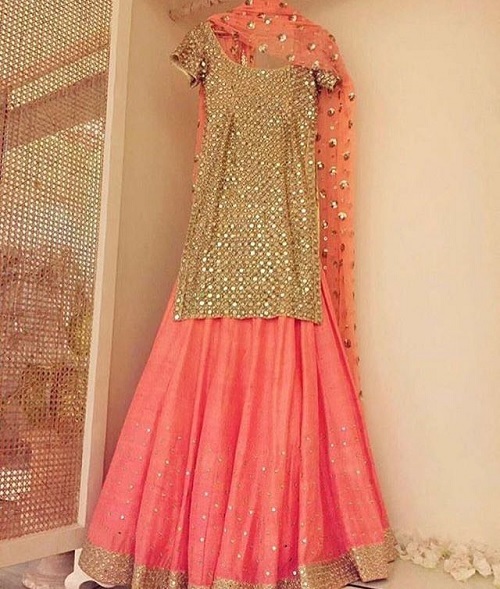 It has a beautiful sheer sequined peach dupatta. The kurti is heavily embroidered and is studded with Mirrors. The peach coloured skirt has gold border which also has more beauty to this beautiful dress. It can be your perfect dress for any wearing that you are going to attend. In fact this can be a good engagement dress. Sleeveless kurti of this lehenga kurta design for women has embroidery in olive green color. While the bottom part has printed fabric. The printed lehenga skirt looks lovely with embroidered top kurta. It comes with mandarin collar. It is a sleeveless dress but can also be stitched with sleeves. This lehenga dress is beautiful. It has short red full sleeves kurti with Chanderi beige gold kurta lehenga. The white heavily embroidered border at the bottom makes it look even prettier. It comes with a Dupatta and the color combination would suit every Indian women. This is our favorite as the color is beautiful. The Canary yellow color as a light baby pink Kurta and the rest of the attire is kept in yellow and gold. The brocade yellow colored sleeveless kurta is paired with a lehenga skirt or a Sharara. The brocade material is used for this entire dress and a sheer chiffon fabric for the kurta. This beige gold straight kurta is teamed up with silk deep gold colored lehenga. The sleeves are till the elbow and come with a sweetheart neckline. This fitted kurta looks ravishing with full flared gold colored skirt. 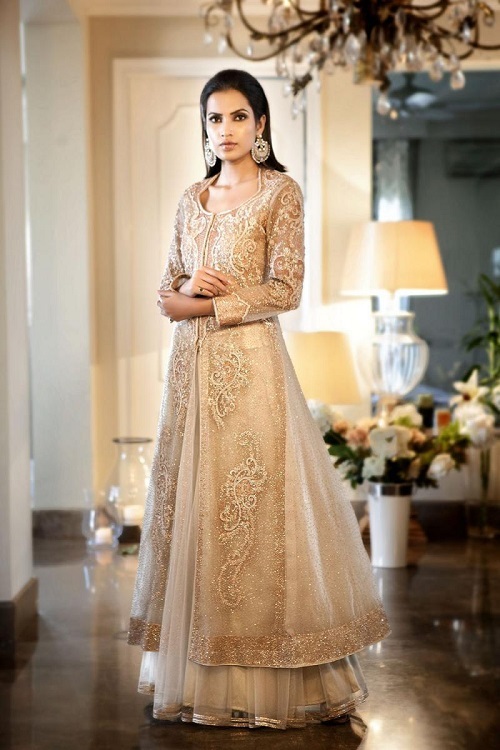 This lehenga is very simple yet give an amazing look to this dress. 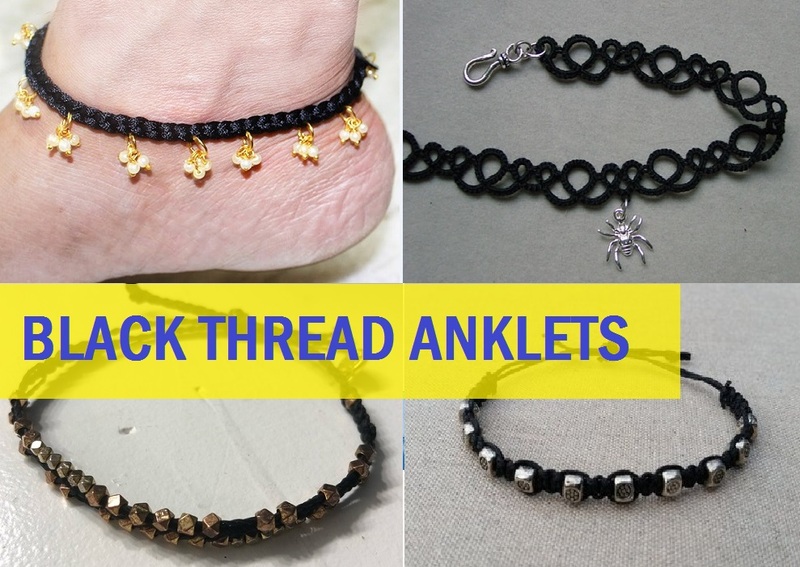 It can be worn for any Indian festival or ceremonies or ethnic rituals. 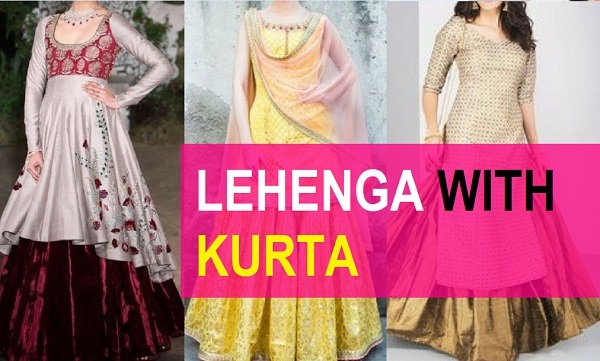 These are the lehenga kurta designs for women which are in trend.